During these dark days, we can benefit from the use of this prayer, called the Breastplate, or Loríca of St. Patrick, “The Cry of the Deer” (Latin Lorica is pronounced lo-REE-ka). It is said that St. Patrick (+461) sang this when an ambush was set for him so that he could not go to Tara to evangelize. Patrick and companions were then hidden from the sight of their enemies, who thought that they were deer when they passed by. However, some scholars date the prayer to the 8th c. Either way, this is a mickle, puissant prayer! One could pray this prayer each and every morning. The Latin word loríca means “a leather cuirass; a defense of any kind; a breastwork, parapet”. In effect, it means “armor”. “Loríca” is also associated with an rhythmic invocation or prayer especially for protection as when going into battle. The Lorica of St. Patrick is rooted in an un-confused belief in the supernatural dimension of our lives, that there truly is a spiritual battle being waged for our souls. This prayer reflects our absolute dependence on the One Three-Personed God. One could pray this prayer each and every morning, upon arising. On St. Patrick’s Day, instead of indulging in meat even on Sunday of Lent and drinking green beer, pastors of parishes should invite people to come to Church for confessions, recitation of the Rosary, Mass, Exposition, the praying of the Lorica, Benediction. In spe resurrectionis ad adipiscendum praemium. Daily recitation? Seems a good thing. Especially for you IRISH out there. Make more of you heritage. This entry was posted in SESSIUNCULA and tagged Lorica of St. Patrick. Bookmark the permalink. St. Patrick may have had a hand in my conversion, since I became Catholic after a trip to Ireland (and no I’m not Irish). If so, thank you, St. Patrick!! It must break his heart to see what Ireland has come to. I think this would be a very powerful way to start off the daily battle we all face. AMEN! St. Patrick, pray for us. This is my customary Morning Offering. I use the translation found in the wonderful novelized biography _The Deer Cry_ written by William G Schofield and published by Longmanns Greene sometime between the World Wars. To my mind, this is the most accurate biography of St. Patrick I have read — far better than the raft of revisionist stuff that has come out in the last 70 or so years that try to turn him into either a legendary figure to be dismissed, or a rebel against the institutional Church (They use the lying Council of Whitby for this, or an autocrat who laid the baseline for a dictatorial Church to follow him. This treats Patrick in faith respectfully and believably. His use of the sources is thorough, accurate and nuanced by a true to life experience of the Faith. Particularly powerful for our time is the chapter when Patrick throws down the idol Crom Cruach. As evidence of his careful use of sources, he correctly recognizes the Late Antique/Early Medieval use of the name Britain for that corner of modern france which contains Brittany. 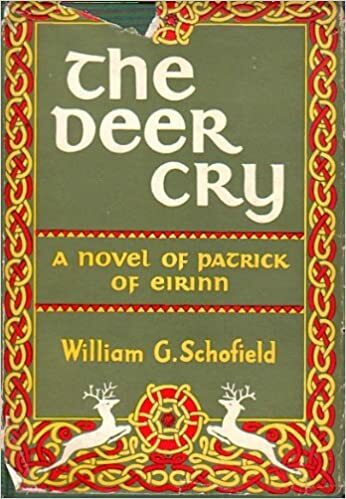 “The Deer Cry: A Novel of Patrick of Eireann” by William G Schofield. It was published 1948. IIt is available used on Amazon ans elsewhere, but I would love to see it come back into print. This Irish girl REALLY likes this as a morning offering! Good idea, Fr. Kelly, thanks! Thank you for the recommendation, Fr. Kelly, I just ordered a copy. Thank you for the book suggestion, Fr. Kelly, and thanks Fr. Z for the Kindle link, which I shall use. Ah, just hardcover. Not surprising, on a book of that vintage. Anyway, I’ll try the excellent Central Catholic Library in Dublin, who may have a copy. Would really love to read it, based on Fr. Kelly’s rec. Fr Kelly may I ask; are you a byzantine priest of any kind? Here is the version our family prayed as a night prayer for many years. I had gotten very tired of the shamrockery of “Irish Day” on this feast, and so put this up on the bulletin boards of the apartment buildings of our complex. Then it occurred to me that it might be a great night prayer for the feast of St. Padraig. The next evening our kids begged (sic) that we memorize it and pray it nightly and so we did. “Daddy, Daddy, Daddy, couldn’t we please memorize this?” I thought they were putting me on, but no . . . . With our having thrown out the TV and with reading the lives of the saints nightly, the love of learning and the desire for God had taken root in their hearts. It was so glorious. Enchanted evenings. If only I could put it in a bottle and sell it to bishops, the baptism of the imagination. God’s word for my clearing. Against snares of the devil. Christ not the less In each heart I address. With faith in the Trinity— Unity—God over all. From The Story of the Irish Race by Seamus Mcmanus (Old Greenwich, Connecticut: Devin-Adair, 1921) 114. It’s only 4:30 and already 8438 downloads. What an incredibly beautiful prayer. Grateful: very beautiful, thank you. The music for the hymn you posted is by the great Sir Charles Villiers Stanford. One of my absolute favorites. If you have a moment listen to “For lo, I raise up. . .” It will give you chills! Byshawn: indeed, the setting is by Stanford and Mrs. Alexander wrote the translation. Yes, I’m familiar with pretty much all Stanford’s choral work and have sung most of it. “Beati quorum via” is a personal favourite. Tré cumhacht a fhilleadh chun breithiúnais. Im aonar nó i gcomhluadar. In aghaidh gach eolas a thruaillíonn coirp agus anam duine. Go dtaga chugam luach mo shaothair. Críost i gcluas gach duine a éisteann liom. Tré admhail Aondacht Cruthaitheoir na Cruthaíochta. Is leis an Tiarna an Slánú, is leis an Tiarna an Slánú. Is le Críost an Slánú. Go raibh do Shlánú linn de shíor, a Chríost.